Last month I paid a visit to my new school, the American School of Bombay. ASB is building a new elementary campus, which I visited while I was there, and since I've been back I've been excited to look at the architect's plans and to read through the report from the R&D Facility Design Task Force. It's clear that the new campus is going to include a variety of work spaces that will completely redefine 21st century learning. The building has been designed for small learning communities with each floor having meeting spaces, labs, learning studios and learning suites with movable walls, common areas, outdoor terraces and a staff work area. The idea is that students and teachers will be able to use these spaces in many ways - for example "campfire" areas where students will receive direct instruction, "watering holes" where students can collaborate together and "cave" spaces for quiet, individual work. The common space on each floor is shared among a small group of teachers who will be supported with professional development and training to develop a community that knows how to properly use the space. There is also a plan for casual eating areas where students can eat on demand - this reminds me of the set up at the Google offices in London. When I attended the Google Teacher Academy I was told that a Google philosophy was that you should never be more than 150 feet away from food! As I looked at the plans I've noticed that on each floor there is a special "wet floor" area which could be used as a multidisciplinary space - for example it could be used as a science lab or as an art studio or a "messy projects" area. These areas are planned to have "passive supervision" which means that project-based learning and personalized learning can be going on in these areas at the same time. Passive supervision is an interesting concept as the plans show a lot of glass walls - partly this is to get natural light into the middle of the building and give a sense of openness while at the same time blocking noise, but this also allows for students to be visible at all times in many different areas such as in the "watering hole" spaces. There will be dedicated areas for specialist subjects such as music and performance areas and areas for health and physical fitness. There also seems to be plenty of outdoor spaces on balconies and rooftop terraces as well as play areas on the ground floor. Once before, when I was at the International School of Amsterdam, I was at a school that built a new campus and had an architect design the school for new ways of working. 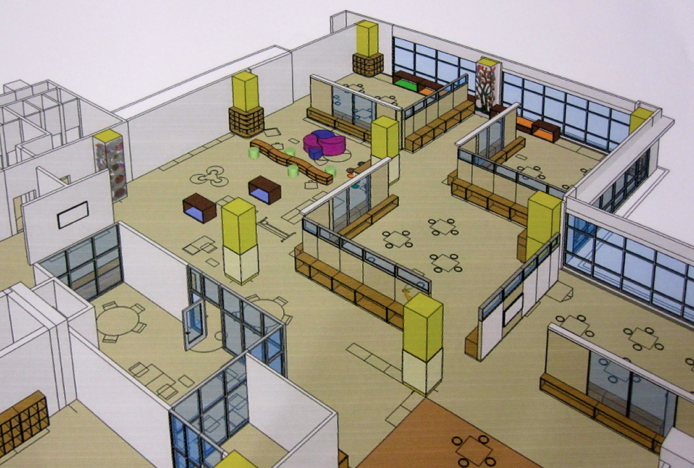 Classrooms were all built in pods around common areas, and each pod had a teacher workroom. The pods themselves were all grouped around an inner courtyard/garden. It was really lovely to move into such a great school building. My new school seems to be going a lot further though and the design and use of space seems incredibly innovative and well-thought out. I'm really excited to be moving to this new campus of ASB and hope to be posting a 10-Picture Tour and reflecting on how this new space is being used in a few months.